Sorry, public registration for this event has been closed. Event Description The Chamber Golf Classic is the largest Chamber fundraiser of the year. The tournament provides opportunity to network, promote your company, and have some fun playing a beautiful golf course. 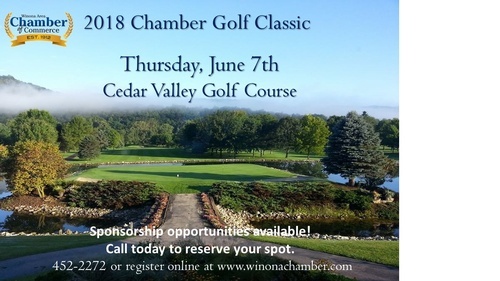 Proceeds support the efforts of the Winona Area Chamber of Commerce in our mission to provide value to our members through business advocacy, training, economic development and the support of tourism. The tournament will be a four-person scramble tournament with plenty of prizes to be awarded. The registration fee includes lunch, golf cart, 18 holes of golf, fun, prizes, and dinner. A portion of the proceeds raised will go directly to the REACH project. REACH is a partnership between the Chamber and the Business Education Committee. **sorry no refunds after Monday, June 4th. If you cancel after that date you will be charged, substations are allowed. Registration & Lunch at Noon, with a shot-gun start at 1:00 p.m.